Rockstar's Grand Theft Auto series is a massively popular franchise. With the popular GTA series already several years old now, there's plenty of little details about the series you might not have known about. We compiled a list of interesting facts and details about the different GTA video games by Rockstar. Let us know in the comment section below what Grand Theft Auto video game got you into the series. Rockstar was developing a video game known as Race 'N Chase. The game had players taking the role of cops as they try to stop robbers. The glitch that had made Rockstar change the format of the game was during a mission where you played as a robber. Apparently, the AI for the cops tried to run the robbers off the road instead of busting them. This was so popular with testers that Rockstar worked around that idea of being a robber running from the law. During development, they scrapped the idea of being a cop all together as it was more fun to play as a criminal. GTA 3 was set to release in 2001 but because of the terrorist attacks within America on September 11 2001, Rockstar had to make changes in the game. While the game was still based in New York City, cops were drastically changed to look less like the NYPD and cut out several missions you played with a terrorist. Rockstar has stated that only about 1% of the game was actually cut. Rockstar has been hit with several lawsuits since the start of GTA. What may surprise you is that a total amount of lawsuits against Rockstar for GTA equals over $1 billion. These lawsuits range from citizens all over the world to big famous celebrities. The latest is Lindsay Lohan suing over her likeness in GTA 5. Driver 3 made a cameo appearance in GTA 3 during a mission where haunt down a character in a black-suit named Tanner. The latest GTA video game in the series, GTA 5 has the biggest map in terms of Rockstar's video games. This map tops the size of Red Dead Redemption, GTA IV, GTA San Andreas combined. Rockstar has even revealed that the game map is even bigger than New York's Manhattan in real-life. While Rockstar didn't fully admit to it, the myth that Rockstar paid for bad press is pretty well known. The story goes that Rockstar hired PR Max Clifford where he sent out stories purposely knowing that the press would have a field day because of how controversial the story would be. Thus Rockstar and their upcoming GTA video game would always be in the press. GTA 4 has 80,000 dialog lines. The script was made to expand through several missions, story dialog and NPCs that randomly talk while roaming around the town. To take that in perspective, GTA 3's script is shown on the left while GTA 4 is on the right. So far, it's unknown as to how big the script GTA 5 currently is. The main character in GTA 4 is Niko Bellic and it was revealed that the character was based off of Vladimir Mashkov, a character from the film Behind Enemy Lines. Vladimir was on a Russian talk show where he admit that Rockstar approached him to do the voice of Niko Bellic but he turned it down. GTA 5 made an outstanding $1 billion within the first three days since the game launched. However, the game itself costs $137 million to develop. That means developing GTA 5 cost more than the production of both Watchmen and Prometheus, two highly regarded blockbuster films. During the mission of GTA 4 Three Leaf Clover, you might recognize the development team made the mission in a result of the movie Heat. Everything from the suits worn to the massive gunfight in the streets are from the film. An outstanding 14 percent of men within the UK admitted that they will call off sick during the launch of GTA 5. That would result in over 2 million men calling sick just to sit back and play through GTA 5. One YouTuber managed to complete the GTA 3 video game in record time. The speed run lasted a little over 1 hour and 12 minutes. That's a pretty impressive time considering how much there is to do in GTA 3 and the amount of traffic and any given moment. Rockstar was meeting with DJ Pooh about the video game music soundtrack when they overheard a phone call. Rapper Young Maylay was approached right away because they loved his voice and found it perfect for the role of CJ Johnson. One of the new aspects in GTA 5 when compared to the other video games in the series is that there are 3 main characters cannot be killed. You can play each one at any given time and players can run into other main characters around the town. However, you won't be able to kill them. Instead if you keep following them, they will turn and knock you out. GTA San Andreas mad headlines after a mod allowed an x-rated mini game to be playable on the PC version of the game. This lead to a big law suit costing Rockstar over $20 million. When GTA 3 launched, there were no motorcycles to ride around the city. However once Liberty City Stories released a couple years later motorcycles became available to use within the game. Turns out that Rockstar couldn't develop the motorcycles but later they were able to figure out just how to bring them into the game. To further explain their absence in GTA 3 and Liberty City Stories, Motorcycles were previously banned within the fictional city. During a certain mission in GTA 4 known as the Final Interview, if you shoot the guard at the top of the last set of stairs, he will let out the famous Willhelm Scream from several big budget films. Ray Liotta is the star of Goodfellas and just so happens to voice Vice City's Tommy Vercetti. However, after completing the game and seeing the sales Vice Cities brought, Ray was upset that he didn't demand more money for his work. If you visit the Grant Bridge in San Andreas you can find a sign that details the bridge in terms of development process. Turns out that the bridge contains over 15,000 polygons, has 600m draw distance, uses 11 textures and takes up 1.27MB on the disc. In GTA San Andreas there is over 360 phrases that contained the word "F@#k" within the game. 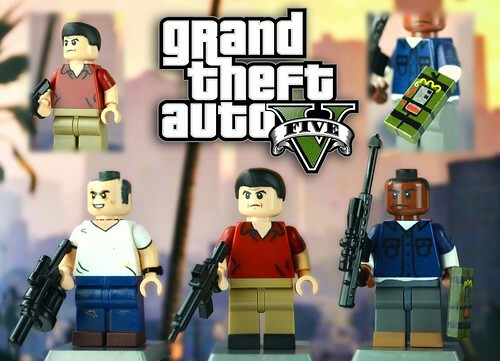 In Japan, a company known as Medicom released limited-edition Lego pieces that resemble GTA 3, Vice City and San Andreas. These pieces are now highly collectable. Rockstar video game universes are connected. Carcer City from Manhunt is mentioned on the GTA Radio and Bully's Bullworth Academy can be seen in a GTA 4 TV show I'm Rich.